A little fairy tale for Paint Party Friday! There is a song by Sam the Sham and the Pharaohs about the wolf in Little Red Liding Hood; how he is going to try to behave himself so that she won't be scared, and he hopes that she might end up liking him. This painting is about how how some girls tame the big bad wolf. Absolutely beautiful! I've just started reading 'Women who Run with the Wolves' so this one really resonates with me at the moment! This is lovely. What paint medium do you use? Thanks, K! This is an acrylic painting, on canvasboard. This is the first time I tried using gold paint (in the apple). It just seemed right to use it in a fairy tale painting. And Rrramone, I have known some very nice wolves. Lynette, this is a wonderful image! It feels romantic and dangerous! Definitely a woman who runs with wolves! Great image! Very Beautiful! Your painting reminds me a little of Frida Kahlo. I love the story behind it! Hey. I subscribed to your blog awhile back, after sharing this image with my my students so they could write and reflect on it -- trying to find thematic similarities between it and To Kill a Mockingbird. It was a challenge for them and good for them. It's been fascinating watching the images unfold, the development. 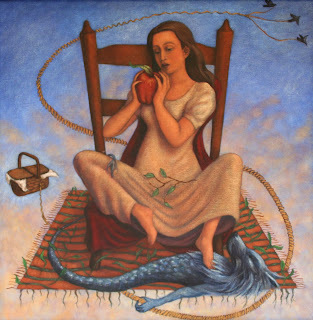 "The next thing I noticed in the painting 'Red Riding Hood' was the apple in Little Red Riding Hood’s hand. It looks as if she is about to take a bite out of it, but at the same time she looks like she is contemplating whether or not to eat it. This reminds me of the Bible story of Adam and Eve. They ate the fruit that they were told not to eat, which was the very first sin of humanity. Because of this, the apple seems to represent contemplating right and wrong and deciding whether or not to do the right thing. "We see this struggle to do the right thing in To Kill a Mockingbird. Throughout the book, the children struggle to keep a cool head when others ridicule Atticus for defending Tom Robinson. Atticus admits that he is more worried about Scout losing her head than Jem, and Scout does lose her head more often. She beats up Walter Cunningham, Cecil Jacobs, and her cousin-once-removed, Francis. Jem only seriously loses his head once in Chapter 11, when he destroys Mrs. Dubose’s flowers." Thanks, Mike! If your students are making connections like this, you must be an excellent teacher as well as a fine artist! That was wonderful. This is a beautiful drawing. Well executed! I really like this too. It is full of symbolism. It looks like she has the upperhand right now and deciding should she or shouldn't she. The basket looks like a picnic basket that represents food to me. Will she feed him? or not! What a wonderful painting. Happy PPF! awesomely wonderful piece! love the concept too. She's got him right where she wants him. Beautiful work. Your work is fabulous- both in concept and execution! I always look forward to seeing what you'll come up with next! FANTASTIC illustration!!!! Glad to see in other post the medium you used. Well done piece! HAPPY PPF! Wow... Magnificent piece Lynette...super gorgeous and so enchanting...wonderful! Love your painting and loved that song. It is now running in my head. I like the theme of your beautiful work! What a vibrant imagination! and the talent shining through! I am in awe. What a wonderful concept. I have been trying to tame that wolf for 15 years...hehe. Your painting is so beautiful! Thank you everyone, for all of your lovely comments. It's wonderful how many of you create an interpretation for Miss Red. It gives me hope that the wolf can indeed be tamed! Great idea and beautiful painting! Wow, this is stunning. I love it. You have mad skills! Beautiful! Happy PPF!